With a community as large as Erie County’s Polonia in the late 1800s, poor and orphaned children were a reality that had to be faced. The mantle for their care was accepted by the Felician Sisters of St. Stanislaus parish in Buffalo. On April 26, 1882, Father Pitass entrusted the first child into their care, planting the seed that would blossom into the Immaculate Heart of Mary Orphan’s Home. In the early years, the first orphans lived in the convent with the sisters and attended school at St Stanislaus. While the sisters raised the children, they also tended to some of Polonia’s elderly who had no one else to care for them. At first only girls were allowed to stay, while the boys were transferred to orphanages out west. As the number of children grew, it was soon determined to be too expensive to transfer the boys and too cruel to split siblings. A true orphanage was needed. In 1894, with permission of the Mother Provincial in Detroit, Father Pitass secured approximately 10 acres at the corner of William Street and Kennedy Road in Cheektowaga. When this area was first laid out in 1894 it was done with a distinct Polish flair, which sadly did not last. The streets around Immaculate Heart were originally to be named Pitass, St. Felix, Walkowiak, and Dombrowski. Instead Pitass became Patricia, Walkowiak became Standard Parkway, and Dombrowski became Starlite with only St. Felix being used. With the help of Jakob Johnson, the home was formally incorporated November 12, 1895 and the first cornerstone for the complex was blessed on October 4, 1896. Over time the complex, known as the Polish Orphan Asylum and Home for the Aged, would grow to include separate dormitories for the boys and the girls, a mother house, a chapel, and a building for the elderly. In 1903, there were 85 boys, 85 girls, and 48 seniors living in the complex. In 1908, the county requested that no more elderly be accepted at the home, but allowed those already living there to stay. The last aged resident died in 1925 and shortly thereafter it was renamed the Immaculate Heart of Mary Orphan’s Home. Slowly the semirural area around the home became more suburban as Poles moved up William and out of the city. By 1905, a large enough Polish neighborhood had grown around the Orphan’s Home to warrant a Catholic Church. On October 16, 1905, St. Josaphat Church was established with Father Andrew Garstka appointed as the first pastor. The first Masses of St. Josaphat parish were held at the mother house of the Orphan’s Home and the campus served as its first school as well. The parish would eventually build its first church west of the home in 1907. By 1945, the home and the sisters had cared for 6,025 children, taught the boys and girls skills and trades they could make a living with, and was well reviewed by the county. Important members of Polonia continued to play a role in the home including Dr. F. E Fronczak and Dr. J. J. Nowak, who helped oversee the health of the children. 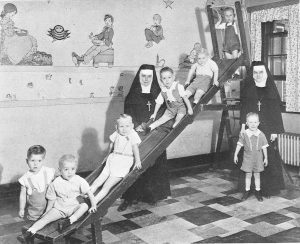 In the 1950s the mission of the home was expanded to help children with special needs. As the demography and needs of the community changed, an orphan’s home with a focus on Polish children was no longer truly needed. The last child was admitted to the home in March of 1979 and the facility closed four years later. The sprawling complex was decimated by two fires and the remaining buildings, save one, were torn down in 1992. Golden Jubilee of the Immaculate Heart of Mary Home for Children: 1895-1945: Historical and Pictorial Souvenir. Place of Publication Not Identified: Publisher Not Identified, 1945. Print. Josker, Karl R. "The Immaculate Heart of Mary Orphan's Home by Karl R. Josker." PBase. N.p., n.d. Web. 23 Jan. 2016. Polskiej I Parafji Św. Stanisława, B. I M. W Buffalo, New York, 1873-1923. [Buffalo, N.Y.]: Nakładem Komitetu Wydawniczego, 1923. Print. Josker, Karl R. "The Immaculate Heart of Mary Orphan's Home by Karl R. Josker." PBase. N.p., n.d. Web. 25 Dec. 2015.